Protesters ask: What would ‘one day without immigrants’ look like? 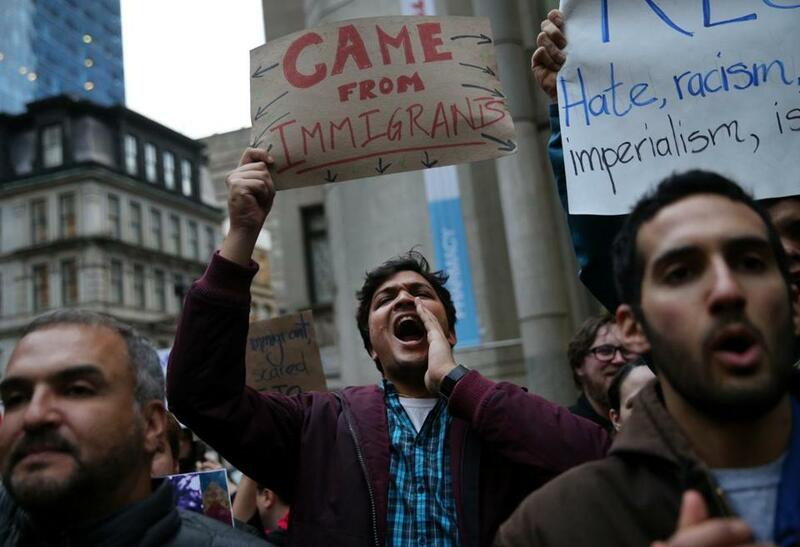 Neil Gupta, of Boston, held a sign during a protest in Downtown Crossing on Thursday. One day after President Trump launched a crackdown on undocumented immigrants, protesters took to the streets of Boston on Thursday to show their support in the region, and to press for full legalization. In late afternoon, more than 100 demonstrators gathered in front of the Irish Famine Memorial in Downtown Crossing, where they vowed to push back against Trump’s controversial executive orders. Under a light rain, participants held signs reading “We Are Here To Stay,” “Immigrant Rights Are Human Rights,” and “Families Have No Borders,” among other pro-immigrant messages. Marisa Bennett, an advocate with the Irish International Immigrant Center, held a “We Are Here To Stay” sign and said Trump’s crackdown runs counter to American values. Trump on Wednesday threatened to pull federal funding to sanctuary cities, launch construction of a wall between the US and Mexico, and vowed to increase federal efforts to detain undocumented immigrants with criminal records. Trump’s attack on sanctuary cities — municipalities that refuse to arrest people solely facing charges of violating immigration law — was met with defiance by Boston Mayor Martin J. Walsh and other municipal leaders around the state. “If people want to live here, they’ll live here. They can use my office. They can use any office in this building,’’ Walsh said at a Wednesday press conference at City Hall. City Councilor Tito Jackson, a mayoral candidate who attended the Downtown Crossing protest, also agreed that Boston will remain a sanctuary city. “Our Police Department will not be used as an agent of the federal government,” Jackson said in a brief interview. The demonstration was organized by a local chapter of the Service Employees International Union, which represents many immigrant workers. It came just hours after a protest in East Boston, where demonstrators carried a black banner that read ““Un Dia Sin Inmigrantes,” Spanish for “one day without immigrants.” They first held the banner, which was about 20 feet long, at the Porter Street overpass near the entrance to the Sumner Tunnel, and later outside the Blue Line station in Maverick Square. “We want our immigrant community to know that we stand with them,’’ said Gloribel Mota, who helped organize the protest through the organization Cosecha, which advocates legalization of all illegal immigrants currently in the US. Mota said the phrase on the banner was chosen to emphasize the key role that immigrants play in the American economy. “If we had a boycott, if we had a general strike. ... One day without immigrants — what would this country look like?’’ she said. Globe staffer John Ellement contributed. Travis Andersen can be reached at Travis.Andersen@globe.com. Follow him on Twitter @TAGlobe. Jessica Rinaldi can be reached at jessica.rinaldi@globe.com. Follow her on Twitter @JRinaldi5.